The CBA National Homebrewers Competition took place in Bristol on Saturday 15th September 2012. Twenty of our members entered a few beers and some entered several more than that. Bryan even entered the same beer into 4 different categories! A number of members also went down to judge – Paul Spearman, Paul Henderson, Simon Ashdown, Ben Fields, Mike Carter and Peter Hughes. By all accounts it was quite tough going, as it would be with 461 to get through. In fact due to the monumental volume of beers the judging finished about 4 hours later than planned so the ‘social’ event never took place. Those of us waiting around availed ourselves of whatever beer was rejected from the judging room which sadly was not the good stuff as that was being kept for ‘best of show’. As it turned out LAB had a very successful competition, both individually and as a group. Our members picked up 11 individual medals, plus one for 3rd overall. We also won Club of the Year for points accumulated in competition over the course of the year. Who would bet against us doing it again next year! Special thanks to Ali Kocho-Williams for organising and running the event. 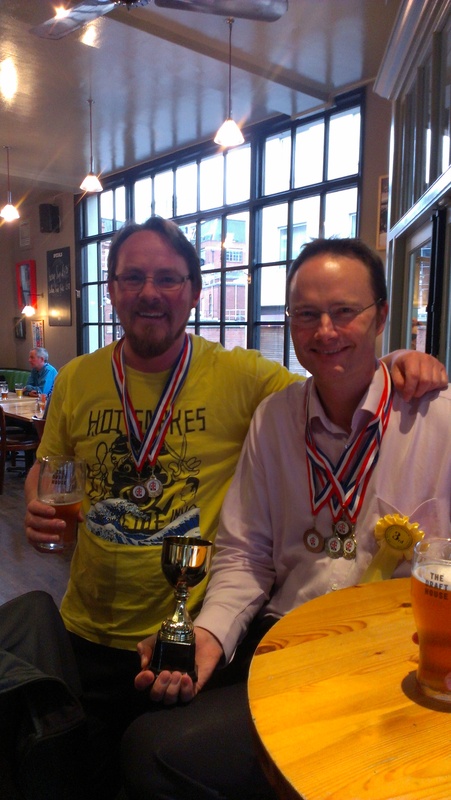 Dave Halse and Ken Bazley celebrate their medals with a few pints of Kernel/LAB Pale Ale @ The Draft House, Tower Bridge. Dust off your mash tun, shake the spiders out of your fermenter, buy some fresh ingredients and get brewing because the London and South East Craft Brewing Competition and Festival date has been set for 2012. As always this will be a friendly competition followed by a festival session in the afternoon and entry is open to all abilities, so if you brewed it then enter it. You can enter kit beers, extract beers, or all grain beers. It’s up to you. Don’t worry if you’ve just started brewing or if you think your brew is “average”. We can all be too self-critical about our beers. You will be able to compare your beer side-by-side with others and will receive judge’s feedback to help you improve your brewing. There will be plenty of people willing to discuss beer and brewing with. This year, due to venue availability, we will setup on Saturday evening and run the judging and festival on the Sunday. Registration is now open. Please read the entry requirements and closing date information carefully. Registration and entry closes several days before the event to help us with the administration. Good luck and I will look forward to seeing you there. The Kernel and London and South East Craft Brewing Competition winner Tom Greasley will be launching their Collaboration brew at the Rake on Monday 19th March. Tom Greasley and fellow London Amateur Brewers will be there to celebrate from 6.30pm onwards sampling the 6% Red IPA so please join us.